While in college he met his wife, Wendy, of twenty-five years and started a family. He currently resides in Bloomington, Indiana with his wife and two children, Kathryn (Kat) and Ethan. His oldest son, Sean, is married and lives on the East Coast. Matthew has long been a fan of fantasy fiction. After graduation, Matthew continued his writing exploits, but his focus was mostly around the theater. 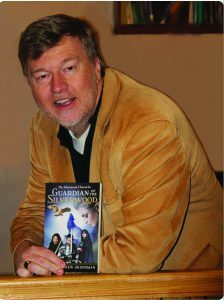 After developing a series of children’s skits in the 2000’s, he was encouraged to take the skits and convert them into a series of children’s chapter books. To date, he has written four of the fourteen stories in the “Chel& Riley Adventures” series. Taking a break from creating children’s fiction and drama, Matthew decided to reach back, at the request from his daughter Kat, and create a fantasy world that mixed all of her favorite thematic elements. This series is currently outlined to cover five volumes; however, he is convinced that there could be many more stories that evolve out of this new universe. Matthew is a recent winner of the 2016 NaNoWriMo challenge, and he is nearing the end of the fourth book in the Silverwood Chronicles series.